NOVATIME digital clocks can display time, date and temperature on a large LED display or can operate as timer or stopwatch. 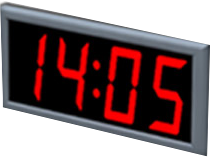 Clocks are available in single or double sided versions, with 4 or 6 digits. Height of the digits might be 57 mm or 100 mm. 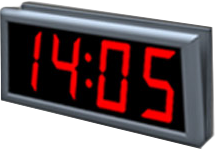 Clocks can operate in stand-alone or networked mode. Any number of clocks can be networked and then all of them can be controlled from a single PC. NovaTime digital clocks feature clear red LED display with elegant silver frame made of anodized aluminium. You can also choose the color of the frame from one of many standard colors. Installation options include both ceiling (top) and the wall (side). NovaTime digital clocks can be controlled using infra-red remote control or serial port (RS-232) when operating in a stand-alone mode. When operating in a networked mode supported communication ports are either RS-485 or Ethernet. NovaTime digital clocks are suitable for all the sites where synchronized time should be displayed regardless of the distances, such as business offices that spread across several floors. Additional features include timer or stopwatch modes of operation more suitable for industrial applications. It is also possible for several clocks to display time across several time zones in a synchronized fashion, thus acting as world time displays. User-friendly, intuitive PC software developed especially for NovaTime products lets you easily configure your clocks and then change various settings, including multiple alarms. When operating in networked mode, all the clocks in the network can be managed from a single PC. This model is the smallest digital clock from our NTW series. Four digits height 57mm are showing time in format HH:MM or date in format DD.MM. Optional, you can order clock with 6 digits, where it is possible to show seconds in format HH:MM:SS, which is useful when clock is using as a stopwatch or timer. Digits are red, very legibly and easily noticeable from the larger distances. All watches from a series of NTW are designed for indoor use. Clocks have elegant framework made of light gray aloxite aluminum which will unobtrusive fit in business ambience, congress rooms or more public spaces such as railway or bus station. Clocks with Ethernet communication can be easily connected in the local computer network. Then it is possible to control all clocks in the system with only one computer. All modern computers have Ethernet port so you don’t need any additional hardware. Clocks are supplied with free software that allows setting for time and date as well as random number of alarms. Clocks can also be set to work as a stopwatch (it count time forward) or timers (it count time backwards). All watches in the system are synchronized and can run the same time or time by different time zones. Optional, watches can display the temperature to. To start the software it requires Windows 2000, XP, or Vista. This model of digital clock is the smallest doublesided clock from our NTW series. They have one clock on each side and usually they are assembled on the ceiling of hallways or rooms. Four digits on each side are 57mm height, and show the time in format HH: MM or date in format DD.MM. Optional you can order clock with 6 digits on each side, where it is possible to show seconds in format HH: MM: SS, which is useful when the clock using as a stopwatch or timer. Digits are red, very legibly and easily noticeable from the larger distances. Clocks with Ethernet communication can be easily connected in the local computer network. Then it is possible to control all watches in the system with only one computer. All modern computers have Ethernet port so you don’t need any additional hardware. Clocks are supplied with free software that allows setting for time and date as well as random number of alarms. Clocks can also be set to work as a stopwatch (to count time forward) or timers (to count time backwards). All watches in the system are synchronized and can run the same time or time by different time zones. Optional, watches can be set to display the temperature to. To start the software it requires Windows 2000, XP, or Vista. This model of digital clock is the biggest clock from our NTW series. Four digits 100mm height show the time in format HH: MM or date in format DD.MM. Optional you can order clock with 6 digits where it is possible to show seconds to, in format HH: MM: SS, which is useful when clock is using as a stopwatch or timer. Digits are red, very legibly and easily noticeable from the larger distances. Because of the his significantly greater height then NTW 57 models, this clock is suitable for larger spaces such as hall entrance or long corridors. All watches from NTW series are designed for indoor use. Clocks have elegant framework made of light gray aloxite aluminum which will unobtrusive fit in business ambience, congress rooms or more public spaces such as railway or bus station. Clocks with Ethernet communication can be easily connected to the local computer network. Then it is possible to control all watches in the system with only one computer. All modern computers have Ethernet port so you don’t need any additional hardware. This model of digital clock is the biggest doublesided clock from our NTW series. They have one clock on each side and usually they are assembled on the ceiling. Four digits, 100mm height show the time in format HH: MM or date in format DD.MM on both sides. Optional you can order clock with 6 digits where it is possible to show seconds to, in format HH: MM: SS, which is useful when clock is using as a stopwatch or timer. Digits are red, very legibly and easily noticeable from the larger distance. Because of the his significantly greater height then NTW 57 models, this clock is suitable for larger spaces such as hall entrance or long corridors.